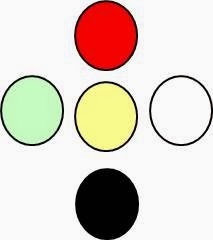 In the first Clinical Tip we discussed the possible origin of the theory of the 5 Elements and the connection between the ancient Four Directions and the Cosmological arrangement of the 5 Elements (with Earth in the Centre). 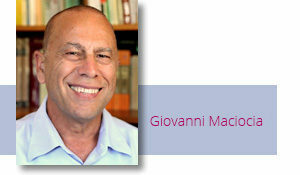 In the second Clinical Tip we discussed the clinical application of the Cosmological Sequence of the 5 Elements. In this third and last Clinical Tip I would like to address the relationship between the 5 Elements and the 4 Seasons. Numerology pervades Chinese medicine very often with contradictions. There is the number 1 which is the Dao, bearing in mind that the Dao is part not only of Daoist philosophy but also of the philosophies of Confucianism and of the Yin-Yang School. There is the number 2 which is of course Yin and Yang. Number 3 is Heaven-Earth-Person (Tian-Di-Ren). I deliberately use the word “person” rather than “man” as ren in Chinese does indeed mean “person”: nan ren is a male person and nu ren a female one. Incidentally, the “Earth” of “Heaven, Earth and Person” is not the same as the “Earth” of the 5 Elements. 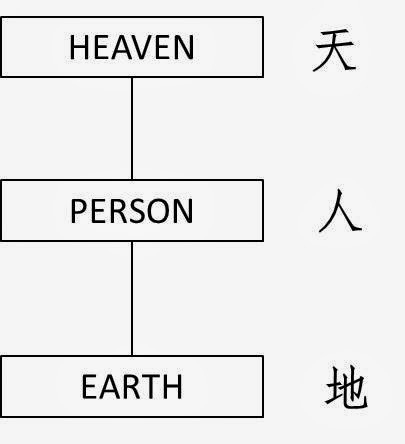 The “Earth” of “Heaven, Earth and Person” is the counterpole of Heaven: Heaven refers to a state of dispersal of Qi and Earth to a state of condensation of Qi. 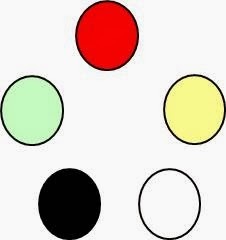 The “Earth” of the 5 Elements is a “neutral” centre of the other four Elements. Number 4 corresponds corresponds to the Four Seasons. Number 5 is of course the 5 Elements. I mentioned contradictions earlier because the correspondence between these numbers and the phenomena they represent is not always smooth and the 4 Seasons and 5 Elements are a good example of this. How do we fit 5 into 4? Another very good example is the conundrum of 12 channels but “5 Zang and 6 Fu”. 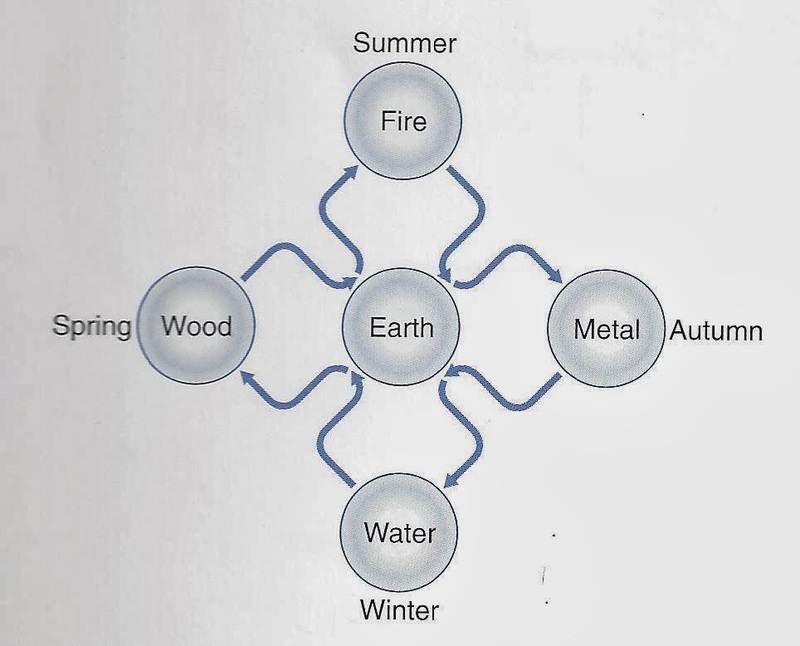 So, how are four seasons reconciled with 5 Elements? They are reconciled because Earth does not correspond to any season, as it is the centre, the neutral term of reference around which the seasons and the other Elements spin. The “Classic of Categories” (Lei Jing, 1624) by Zhang Jie Bin has a very interesting statement: “The Spleen belongs to Earth which pertains to the Centre, its influence manifests for 18 days at the end of each of the four seasons and it does not pertain to any season on its own”. This confirms that the Spleen does not correspond to any season and that its influence manifests for 18 days at the end of each season. Again, it is better to refer to the Cosmological arrangements of the 5 Elements rather than the Generating (Sheng) sequence. In the Cosmological arrangement, the Spleen is in the centre and does not correspond to any season. In the Generating sequence, the Earth has moved out between Fire and Metal and, as it comes after Fire (Summer), it “must” correspond to “Late Summer”. The association between Earth and Late Summer has never convinced me. What the Lei Jing says about the energy of the Spleen influencing the end of every season is more convincing. The Earth provides nourishment, and it make sense that the Spleen should influence the end of every season. The same idea is also in the “Discussion of Prescriptions from the Golden Chest” (Jin Gui Yao Lue, c. AD 220) by Zhang Zhong Jing: “During the last period of each season, the Spleen is strong enough to resist pathogenic factors”. Thus, in the cycle of seasons, the Earth actually corresponds to the late stage of each season. Although the Earth element is often associated with “Late Summer” or “Indian Summer”, it also corresponds to “Late Winter”, “Late Spring” and “Late Autumn”. Clinically, the position of the Earth in the centre makes sense as the Earth is the origin of nourishment and the Stomach and Spleen are the source of Post-Natal Qi. Nourishing the Earth and tonifying the Stomach and Spleen will tonify all other organs. The association of the Spleen with the end phase of each season also has some clinical relevance as Qi and Blood tend to decline at the end of each season (especially autumn and winter) and it therefore makes sense to tonify Stomach and Spleen then. To tonify Stomach and Spleen, I use ST-36 Zusanli and SP-6 Sanyinjiao, often with moxa on the needle. If they are particularly deficient, I add direct moxa cones on BL-20 Pishu and BL-21 Weishu. 1. 1982 Classic of Categories (Lei Jing), People’s Health Publishing House, Beijing, p 46 (first published 1624). 2. 1981 Discussion of Prescriptions of the Golden Chest (Jin Gui Yao Lue Fang Lun), Zhejiang Scientific Publishing House, p 1 (first published c. AD 220).